Flamma by FUEGORED is published under a Creative Commons Atribution-NonCommercial-ShareAlike 3.0 Unported License. 2009. Efectos de los incendios forestales sobre los suelos en España. El estado de la cuestión visto por los científicos españoles. A. Cerdà, J. Mataix-Solera (Eds). Càtedra de Divulgació de la Ciència. Universitat de Valencia. 529 pp. ISBN: 978-84-370-7653-9. 2010. Actualización de Métodos y Técnicas para el Estudio de los Suelos Afectados por Incendios Forestales. A. Cerdà, A. Jordán (Eds.). Cátedra de Divulgació de la Ciència, Universitat de València, FUEGORED 2010. Valencia. 521 pp. ISBN: 978-84-370-7887-8. Descarga alternativa desde la web oficial del Centro de Investigación Forestal Lourizán. ﻿2015. Vivir en el suelo. Guión: M. Pilar Jiménez Alexandre. Dibujo: Estudio Tangaraño. Asesoramiento: M.T. Barral Silva y F. Díaz-Fierros. Sociedad Española de la Ciencia del Suelo (Delegación Territorial de Galicia), CSIC, Obra Social "La Caixa". 2015. Living in the soil. Guión: M. Pilar Jiménez Alexandre. Dibujo: Estudio Tangaraño. Asesoramiento: M.T. Barral Silva y F. Díaz-Fierros. Sociedad Española de la Ciencia del Suelo (Delegación Territorial de Galicia), CSIC, Obra Social "La Caixa". 2010. Investigación y Gestión para la Protección del Suelo y Restauración de los Ecosistemas Forestales afectados por Incendios Forestales. Research and post-fire Management: Soil Protection and Rehabilitation Techniques for Burnt Forest Ecosystems. M. Díaz Raviña, E. Benito, T. Carballas, M.T. Fontúrbel y J.A. Vega (Eds.). IIAG (CSIC) - FUEGORED 2010. Santiago de Compostela.326 pp. ISBN: 978-84-8408-583-6. 2010. Investigación y Gestión para la Protección del Suelo y Restauración de los Ecosistemas Forestales afectados por Incendios Forestales. Guía de campo. M. Díaz Raviña, E. Benito, T. Carballas, M.T. Fontúrbel y J.A. Vega (Eds.). IIAG (CSIC) - FUEGORED 2010. Santiago de Compostela. 2009. Advances in forest fire effects on soils 2009. Book of Abstracts of the Communications presented to the II International Meeting on Forest Fire Effects on Soils (FUEGORED 2009, Sevilla-Cortegana (Huelva), Nov 4-6, 2009). A. Jordán, L.M. Zavala, J.M. de la Rosa, H. Knicker, J.A. González-Pérez, F.J. González-Vila (Eds.). IRNAS-CSIC-Universidad de Sevilla. Sevilla. 144 pp. 2008. Efectos de los incendios forestales sobre los suelos. A. Cerdà, J. Mataix-Solera, Merche B. Bodí. Universitat de València. Valencia. 2013. Grandes incêndios florestais, erosão, degradação e medidas de recuperação dos solos. A. Bento-Gonçalves, A. Vieira (Eds. ), Núcleo de Investigação en Geografia e Planeamento (NIGP), Universidade do Minho. Guimaraes. 298 pp. ISBN: 978-989-97214-2-5. 2012. Fire in Mediterranean ecosystems. Ecology, evolution and management. J.E. Keeley, W.J. Bond, R.A. Bradstock, J.G. Pausas, P.W. Rundel. Cambridge University Press. Cambridge. 515 pp. ISBN 978-0-521-82491-0. 2012. Post-Fire Management and Restoration of Southern European Forests. F. Moreira, M. Arianoutsou, P. Corona, J. De las Heras (Eds.). Springer, Managing Forest Ecosystems 24. 329 pp. ISBN 978-94-007-2207-1. DOI: 10.1007/978-94-007-2208-8. 2010. Ecologia do fogo e gestão de áreas ardidas. F. Moreira, F.X. Catry, J. S. Silva, F. Rego (Eds.). ISA Press. Lisboa. 323 pp. ISBN: 978-972-8669-48-5. 2008. Fire effects on soils and restoration strategies. A. Cerdà, P. Robichaud (Eds). Science Publishers, Inc. Enfield, New Hampshire USA. 2007. Incendios Forestales, Suelos y Erosión Hídrica. J. Mataix-Solera (Ed.). Caja Mediterráneo CEMACAM Font Roja-Alcoi. Alicante. 2015. The role of ash in fire-affected ecosystems, Catena. Guest editors: Paulo Pereira, Antonio Jordán, Artemi Cerdà, Deborah Martin. 2014. Geo-environmental effects of wildfires. Cuadernos de Investigación Geográfica 40. Editors: Artemi Cerdà, Noemí Solange, José M. García-Ruiz. 2013. Soil water repellency. Catena 108. Guest editors: Antonio Jordán, Lorena M. Zavala, Jorge Mataix-Solera, Stefan H. Doerr. 2012. Fire effects on soil properties. Geoderma 191. Editors: António Avelino Batista Vieira, António José Bento Gonçalves. 2012. Monogràfic sobre incendis forestals. Treballs de la Societat Catalana de Geografia 71-72. Coordinador: Xavier Úbeda. 2011. Cuan es crema el bosc. Mètode 70. Coordinador: Artemi Cerdà. 2011. Fire effects on soil properties: Forest fires and prescribed fires. Environmental Research 111(2). Editors: Çağatay Tavşanoğlu, Xavier Úbeda. 2008. Fire effects on soil properties. Catena 74(3). Editors: Xavier Úbeda, Jorge Mataix-Solera. 2005. Fire effects on soil system functioning: new insights and future challenges. International Journal of Wildland Fire 14(4). Editors: Stefan H. Doerr, Artemi Cerdà. Almendros G, González-Vila FJ. 2012. Wildfires, soil carbon balance and resilient organic matter in Mediterranean ecosystems. A review. Spanish Journal of Soil Science 2: 8-33. Knicker H. 2011. Pyrogenic organic matter in soil – Its origin and occurrence, its chemistry and survival in soil environments. Quaternary International 243: 251-263. Badía D, Martí C, Charte R. 2011. Soil erosion and conservation measures in semiarid ecosystems affected by wildfires. En: Godone S, Stanchi S (eds. ), Soil erosion studies. InTech. Rijeka (Croacia). Mataix-Solera J, Cerdà A, Arcenegui V, Jordán A, Zavala LM. 2011. Fire effects on soil aggregation: a review. Earth-Science Reviews 109: 44-6. Shakesby RA. 2011. Post-wildfire soil erosion in the Mediterranean: Review and future research directions. Earth-Science Reviews 105:71-100. Pausas JG, Keeley JE. 2009. A burning story: the role of fire in the history of life. Bioscience 59:593-601. Knicker H, Hilscher A, González-Vila FJ, Almendros G. 2008. A new conceptual model for the structural properties of char produced during vegetation fires. Organic Geochemistry 39: 935-939. Knicker H. 2007. How does fire affect the nature and stability of soil organic nitrogen and carbon? A review. Biogeochemistry 85:91-118. Shakesby RA, Doerr SH. 2006. Wildfire as a hydrological and geomorphological agent. Earth Science Reviews 74:269-307. Certini G. 2005. Effects of fire on properties of forest soils: a review. Oecologia 143:1-10. González-Pérez JA, González-Vila FJ, Almendros G, Knicker H. 2004. The effect of fire on soil organic matter – a review. Environment International 30:855-870. Doerr SH, Shakesby RA, Walsh RPD. 2000. Soil water repellency: its causes, characteristics and hydrogeomorphological significance. Earth Sciences Reviews 51:33-65. Neary DG, Klopatek CC, DeBano LF, Ffolliott P. 1999. Fire effects on belowground sustainability: a review and synthesis. Forest Ecology and Management 122:51-71. Martín MP, Chuvieco E, Aguado I. 1998. La incidencia de los incendios forestales en España. Serie Geográfica 7:23-26. Raison RJ. 1979. Modifications of the soil environment by vegetation fires, with particular reference to nitrogen transformations: a review. Plant and Soil 51:73-108. FUEGORED. The view after 5 years of networking. EGU2013. 7-12 April 2013. Viena, Austria. FUEGORED, poster. III International Meeting of Fire Effects on Soil Properties (FESP 2011). 15-19 March 2011. Guimarães, Portugal. FUEGORED, presentation. III International Meeting of Fire Effects on Soil Properties (FESP 2011). 15-19 March 2011. Guimarães, Portugal. 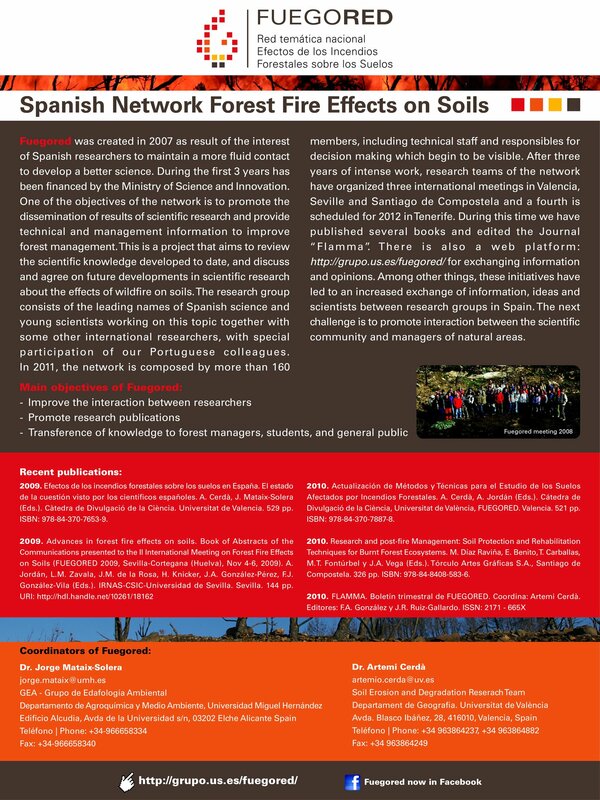 FUEGORED - The Spanish Scientific Networl on the Effects of Forest Fires on the Soil System. 7th International Conference on Geomorphology. 6-11 July 2009. Melbourne, Australia.